With all the exciting events from this weekend’s big engagement, Ryan and I are two sleepy people this evening. After Ryan opened his birthday presents (he liked ’em, yay! ), we nixed the idea of a nice sit down dinner in favor of a low key meal at Jimmy John’s, followed by an ice cream treat from Jeremiah’s Italian Ice. 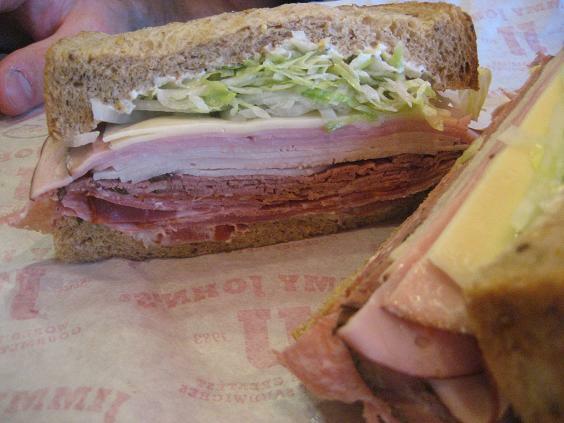 Ryan ordered the Gargantuan on the seven-grain bread from Jimmy John’s. Look at all that meat! I opted for a roast beef sub on their famous French bread. I ate my whole sub and quite a few bites of Ryan’s. The seven-grain bread on his sandwich was doughy and so fresh! I couldn’t get enough! 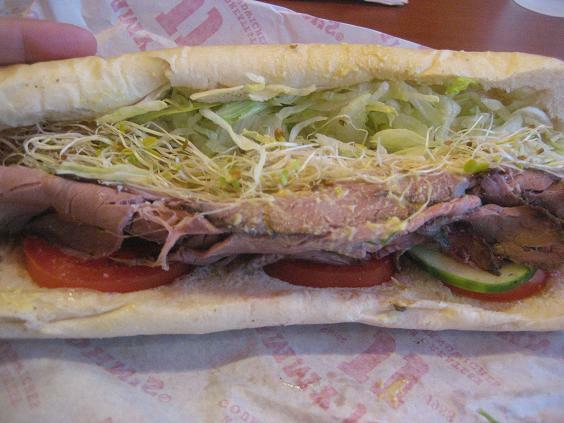 Though I love the French bread from Jimmy John’s that I had on my sub, I wish they made a whole wheat sub bread. 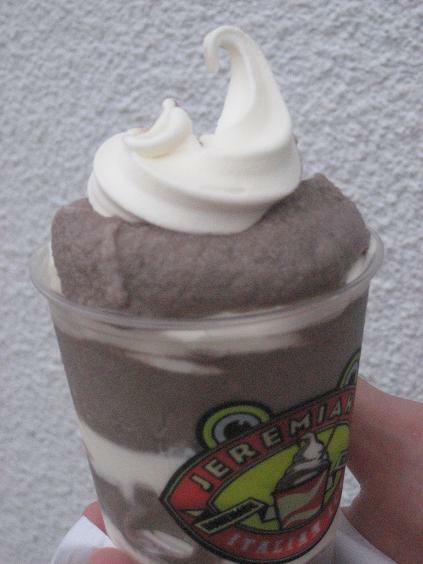 After dinner, we headed to Jeremiah’s, a local ice cream stand and ordered cookies ‘n’ cream gelati (it’s a softer version of gelato) with vanilla soft serve. This dessert is one of the best in Orlando! We’re off to relax and munch on some of the Swedish Fish Ryan’s mom sent him for his birthday before hittin’ the hay. Good night! 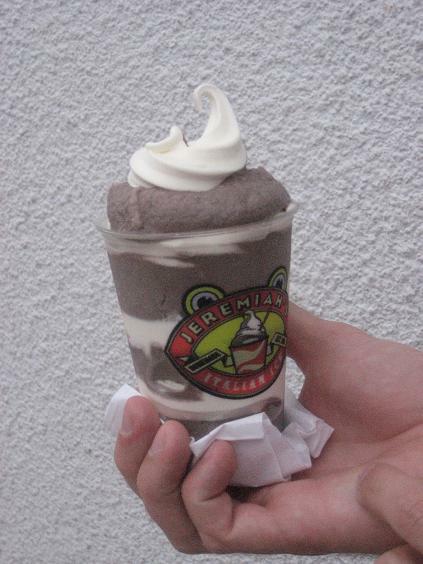 I haven’t had ice cream in forever and that looks great! that is a HUGE sandwich. Did he finish it all? 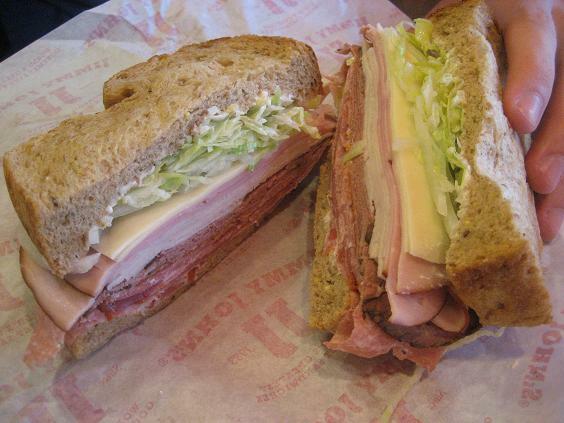 I always get the Turkey Tom unwich at Jimmy Johns!